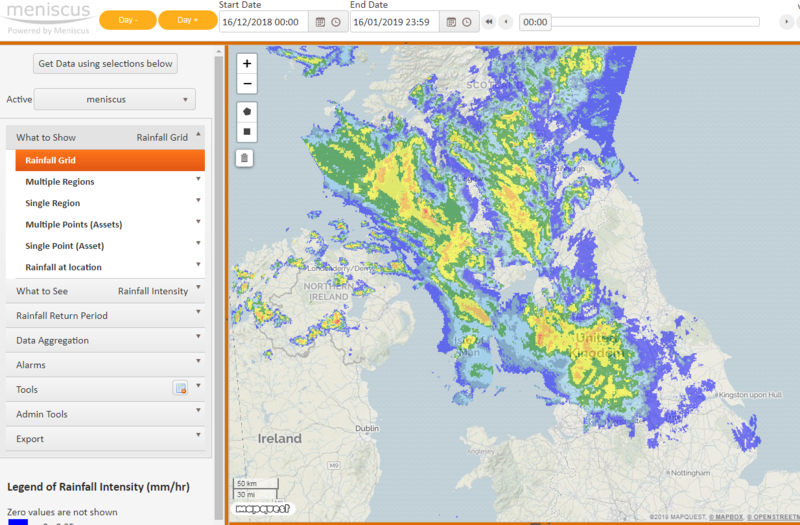 We recently updated MAP Rain to display rainfall as an image making it much faster to display new images. Previously we displayed rainfall for each individual 1 km square cell. 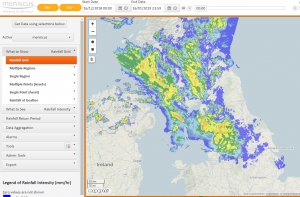 MAP Rain processes data in km squares using the Ordnance Survey Grid Reference system but the dashboard uses the WGS84 projection. So to produce a suitable image we have to go through several stages. Use the four corners of the visible area of the map and return the min/max Easting and Northings required to fully display the image. We add a small amount to each side to ensure it is covered on the screen. Render an image for these Easting and Northings values from the internal grid that represents the data at the relevant time. Then ‘warp’ this image to change the projection from a flat grid reference to the representation of that grid on the map. This is why the top and bottom of the returned trapezoid are curved and it is wider at the top than the bottom (imagine taking a sheet of paper and placing on a globe). We then display this image on the dashboard. This process allows us to return different ‘zoom’ levels of the image with each having a better resolution. Most other mapping solutions limit the zoom level as they only display the one image for the whole of the UK.